A true family affair, the restoration of this Grumman amphibian was ‘all hands on deck’ for the Pemberton family. Warbird Digest sits down with Randy Sohn, the man, the myth, the legend, …and one really down to earth guy! From a single seed planted long ago, sprouted one man’s long held dream to return a Mosquito to the air. This has grown into an effort that has so far seen two examples of the type fly again, the latest for the Flying Heritage and Combat Armor Museum. 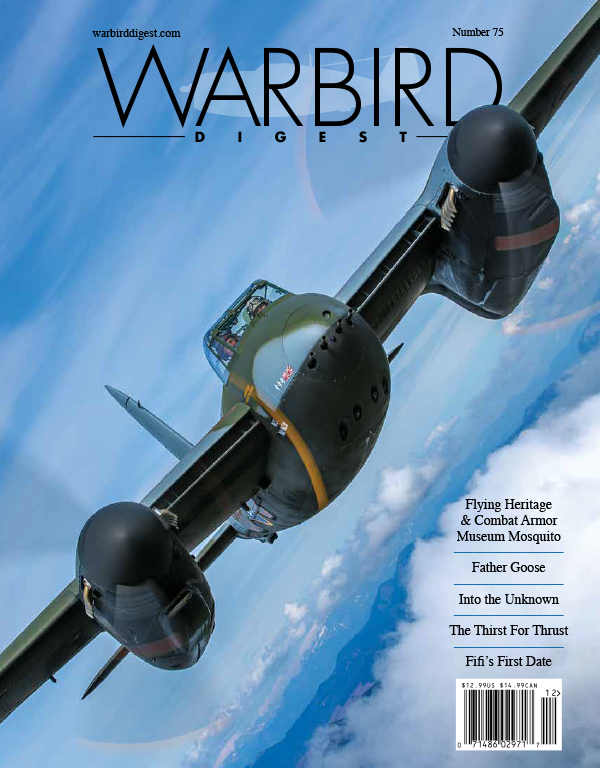 Warbird Digest harvested the details. Honoring the test pilots and engineers that pushed the limits and boundaries of aviation during the war years, this new Mustang restoration by Pacific Fighters is a stunning X-ample of the breed. Longing for more pep in your jet? This souped-up blowtorch will quench your needs! This sprightly British trainer is no dog despite its name, and that’s no bull!